What is a CSA? Well, to put it short and sweet, it’s where the community has the ability to purchase shares of a local farm. That doesn’t mean ownership, but it does mean product. We started our share a few months back with River Creek Farm in Limestone, Tennessee. After having a baby last year, and worrying about turning 40..I wanted to really start paying more attention to the food we’re putting in our bodies. It’s hard for us to eat healthy owning three companies, two kids, and then there’s our house and the crazy beagle. Yeah, we’re kinda busy. So running through our local Pal’s drive-thru, or calling for pizza delivery was becoming a staple in our house. I feel like since I made the decision to start buying fresh veggies, I might as well challenge myself to learn some new things! SO far, I’ve made roasted veggies, red sauces, AND I’ve make wilted greens. I know that it seems simple, but for someone who had never attempted it, I was a little intimidated. I was unsure about how long, and the “consistency” of it. What if I overcooked it or under cooked it? Turns out, I nailed it. Shew…my first real post. 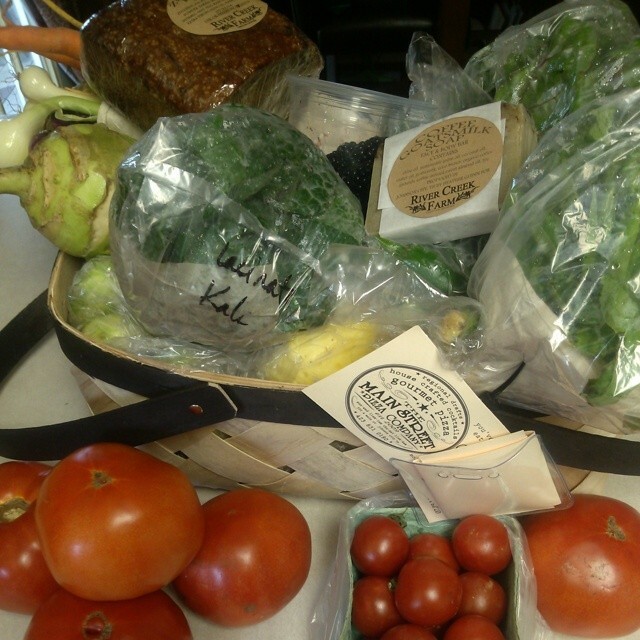 This week I pick up another basket..and since it’s harvest season, I can’t wait to see what goodies River Creek Farm is going to send me to work with. I’ll make sure to take LOTS of pictures, might even do a few short videos. I have “bucket list” that you can read about on my “About Me” page. You just never know what might happen in My Tennessee Kitchen!